George Plimpton may be one of the most interesting Americans ever. Foremost a sports journalist, he was also a novelist, Fireworks Commissioner for New York City and host of Mouseterpiece Theater. Some of you may also recognize him as one of the men who tackled Robert F. Kennedy's assassin, Sirhan Sirhan. But most of you probably remember him as the pitchman for products like Pop Secret Popcorn and the Intellivision video game console. Actually, his most appreciated work would probably be a series of books outlining his own experiences attempting to play professional sports as a journalist. He pitched against the National League All-Stars in baseball, boxed Sugar Ray Robinson and golfed with Jack Nicklaus, using his brilliant writing to bring Americans closer than ever to these sports and their heroes. 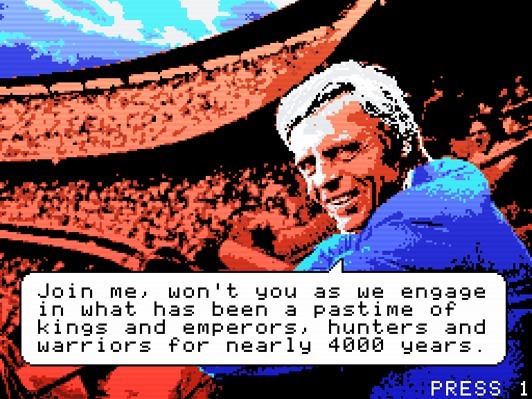 Plimpton died in 2003, but his comedic and athletic legacy lives on thanks to John Hodgman and Tom Fulp, who used Plimpton as inspiration for the faux-ColecoVision sports game classic, George Plimpton's Video Falconry (GPVF). GPVF was born as a joke in Episode 22 of the Judge John Hodgman podcast, which discussed whether strategy guides for video games was considered cheating. Hodgman conceded that he had in fact cheated in a game before, by using a cheat code in a game called George Plimpton's Video Falconry, allegedly released in 1983 on ColecoVision. Listeners around the world were confused, though most probably didn't give the joke much thought. A month later, the above video by Newgrounds appeared on their YouTube channel, supposedly a commercial for George Plimpton's Video Falconry. It was "unearthed" by Newgrounds filmmaker Nathan Kuruna for a documentary. It's funny how ColecoVision was ahead of its time graphically, but the sprites in that commercial look pretty modern. On June 2nd, the joke was completed. 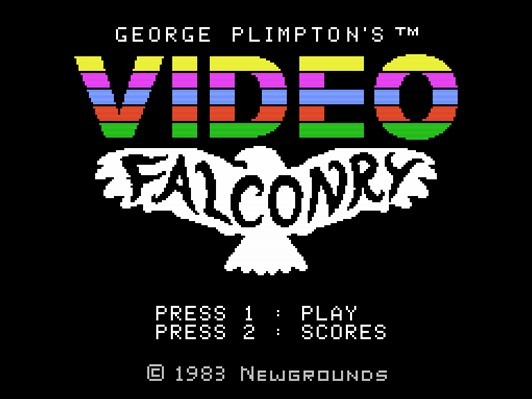 Tom Fulp released a port of the "classic ColecoVision" game, George Plimpton's Video Falconry, on his comedy game website Newgrounds, free and playable for all. The keyboard controls are based on the buttons Hodgman described in his original podcast and the ColecoVision controller layout. Players must control a falcon as it flies around catching animals before returning to Plimpton's waiting hand. It's a tough game with seven buttons—six more than most Newgrounds games use. Unquestionably, the best parts are the interstitial sequences that feature a digitized Plimpton describing various levels of the game in the style of his famous sports writing. There's also a hilarious introductory video containing real information about Plimpton and the fake explanation of how GPVF was birthed. If you need a Flash game to kill some time, GPVF should do the job. If you're familiar with Plimpton's lifework, then the jokes will only make it better. But my only problem with the game is that the falcon was apparently trained by a backwards-NASCAR driver; She can only turn clockwise (to the right), as opposed to racing's counterclockwise movement. This is the basis of much of the game's challenge, which strikes me as arbitrary. Given that Fulp and a small team of fellow Newgrounders made the game in about a month, the lack of really interesting game mechanics is forgivable. It's definitely not a game you would sink sixty bucks and four months of your time into, just one to play until you get all the jokes, and that's perfectly fine.